E.O. 13761 was issued by President Obama on 13 January 2017, one week before Russia Donald Trump was inaugurated. It noted that there had been significant progress by Sudan towards addressing the human rights and national security concerns that originally led the US to impose sanctions on Khartoum, namely those in E.O 13067 (1997) and E.O. 13412 (2006). Importantly, E.O. 13761 did not immediately lift relevant sanctions, but instead said that parts of E.O 13067 and the entirety of E.O. 13412 would be revoked in six months, if the incoming Secretary of State publishes a notice that “the Government of Sudan has sustained the positive actions that gave rise to this order” before 12 July 2017. The July decision was never going to be an easy choice, as the International Crisis Group rightly noted: “To lift sanctions would reward a regime that must do much more to improve governance and end its wars; not to do so could lead to a reversal of advances made and discourage further cooperation.” So it’s not surprising that the Administration kicked the can for another three months, especially given State Department staffing issues and competing priorities. But it is why they said they kicked the can that makes things interesting. State Department noted that it remains “deeply committed to engagement with the [Government of Sudan] and working toward further progress on achieving a sustainable peace in Sudan”. But its parting thought on the subject was the following: “the Administration is also committed to…ensuring that Sudan is committed to the full implementation of UN Security Council resolutions on North Korea”. I received a few queries about this today, so let me explain. Last week the UN Security Council held an emergency session on North Korea in reaction to Pyongyang’s 4th July fireworks. It was a nothing burger of a session, with the exception that the Russians denied that the missile was actually an ICBM. Most importantly for this discussion, however, Nikki Haley also put everyone “on notice” that the US would curb trade with countries who continued to deal with North Korea. As I explained to a few journalists after her statement, that was not just a comment about China. 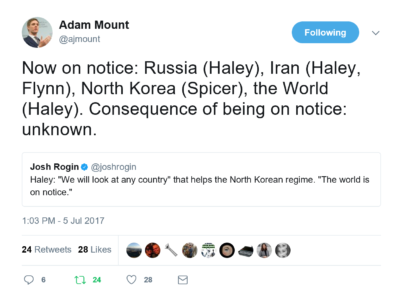 There are a lot of countries that continue to maintain political and trade relationships with North Korea of the variety Haley described. Then, in 2015, the US Treasury sanctioned Jang Song Chol, a North Korean official and arms trader in Russia, who is “working with individuals in Sudan who are procuring materials from him”. It’s unclear whether the incidents are related, but the designation revealed the US Government’s belief that there were military dealings between North Korea and Sudan current as of 2015. One year later, the US added two more relevant designations to the list. “Kim Song Chol and Son Jong Hyok are KOMID officials located in Egypt and have conducted business in Sudan on behalf of KOMID’s interests”(KOMID is North Korea’s primary arms dealer). All of this indicates that Sudan and North Korea have had a military trade relationship spanning at least eight years, in violation of the UN sanctions regime on Pyongyang. Unlike other previous North Korean military customers, this is more than flirtation for Khartoum. The Sudanese subsequently told the South Koreans that they have “completely” cut off military ties to North Korea, and there were no high-level bilateral exchanges on the cards. State Department’s announcement that the President extended the sanctions review on Sudan throws some doubt on those assurances, and injects a new variable into the issue of Sudan sanctions listing. North Korea has not traditionally been part of the conversation over the circumstances in which those restrictions would be revoked (at least not the public conversation). It is now. It is not yet clear how this will play out if the US does assess there to be an ongoing defense trade relationship between Khartoum and Pyongyang. One possibility is that Trump tries to make an example of Sudan. The Administration could refer to the warning that Nikki Haley issued in the Security Council, revoke E.O. 13761, and demand progress from Sudan before relaxing relevant sanctions. It might hope that, together with recent actions against Chinese entities, this move would signal to others that it is serious about restricting the US trading privileges of North Korean partners worldwide. There is another, less scrappy approach. It is possible that when the extended review period comes to an end, the Trump administration will relax sanctions on Sudan in accordance with E.O. 13761, but make new designations (or redesignate currently listed Sudanese entities) pursuant to other authorities on North Korea. This would help silo the US’ goals in relation to the Sudanese conflict and regional security from those on the North Korea issue. But in doing so would dilute the message on the importance of the latter to Washington. In effect, they would be publicly putting Khartoum on notice that it is…well…on notice. Either way, this could make for an interesting test case for analysts of the Trump administration’s policy of tackling the North Korea threat by tackling others. *Update: thanks to a reader for reminding me that State Department issued a new set of sanctions in March 2017 pursuant to the Iran, North Korea and Syria Nonproliferation Act. Those updates included two Sudanese entities (Giad Heavy Industries and the Military Industries Corp) as well as one individual. While State Department outlined how eleven of the designations were made because of activity related to Iran’s ballistic missile program, it did not say whether the remainder (including the three Sudan designations) were added in relation to concerns over Iran, North Korea, or Syria. It’s possible that they also belong in this discussion.